Hidden behind steep hills in the southern shore of Bali, lay Pandawa Beach. Situated near an old limestone quarry, Pandawa beach once is a secret beach. It was not until the government cutting the hillside to build a road that the beach becomes accessible. 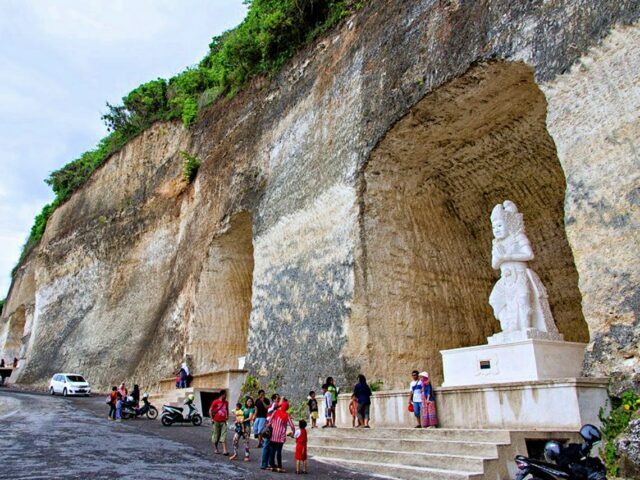 After the access is easy, it becomes a new favorite among beachgoers in Bali. In 2018 alone, more than half a million foreign tourists have visited Pandawa. Pandawa Beach features a breathtakingly long shore that stretches for 1 km long. The sand is white, meeting the turquoise ocean waves. 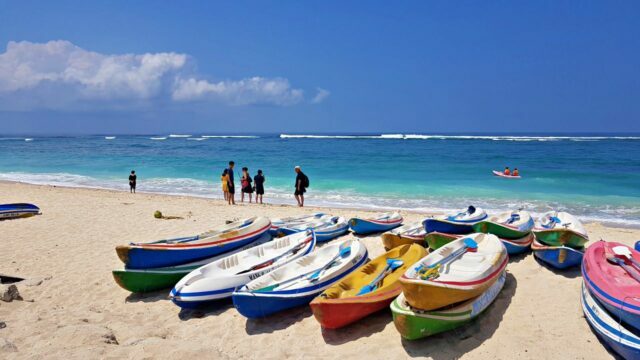 Compared to Kuta Beach and other more popular beaches, Pandawa is clean and free from any debris. The government awarded Pandawa Beach with Indonesia Sustainable Tourism Award (ISTA) in 2018 due to its good management. Because Pandawa Beach borders the southern sea, the beach is prone to rough current. Strong waves are great for surfing in good weather. However, precaution is advised especially during the monsoon season when the tide can go as high as 2,5 meters. Pandawa beach is also subject to rip current. A strong narrow current that can be dangerous for swimmers. Before entering the beach, notice there are 6 statues welcoming. Make a quick stop to see these works of art. The statues, inspired from Hindu mythology Pandawa, give the beach its name. These are five Pandawa brothers and their mother, Kunti. Each is carved inside a hollow. Facing toward the sea, they stand as if guarding. A clean and untouched beach. Pandawa is a dreamy place to lounge around just watching the day go by. Never get tired with the ocean view, blue and teal water extends far into the horizon. The sound of waves chasing each other is the best soundtrack nature can provide. The less crowd is an additional blessing. Sunbath until getting the shade of tan as desires. Sunblock is a must since the sun here can be unforgiving – there isn't any tree. Get up and walk into the water lying under the sun gets boring. The water is swimmable, only be careful with the sharp rock in the bottom. The waves at Pandawa is great for surfing and calm enough for kayaking. Surfing courses, like in Kuta, teach eager students from beginner to intermediate. At least try one – or two- between these water sports. Either chasing the waves with a surfboard or paddling around with a kayak, both are fun. Renting a canoe costs IDR 50k while a surfing lesson starts from IDR 100k. Pandawa Beach is also a good site to do sky sports. The high cliffs around make it possible. A nearby hill called Timbis is a favorite launch point for paragliding. 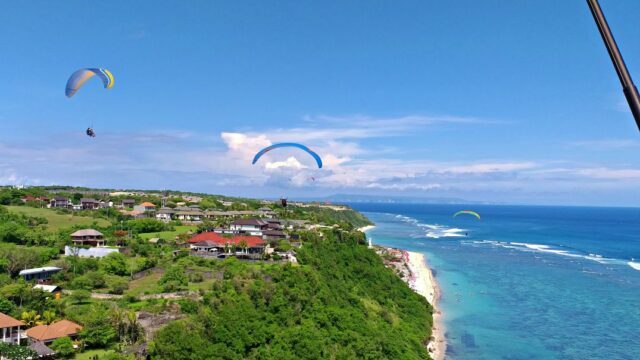 Choose a tandem paragliding for visitors without prior flying experience. Accompany by reliable and professional pilots. There is no reason to worry about safety while enjoying the unforgettable view. Before opened for tourism, Pandawa beach is a seaweed farm. Along the coasts, seaweed patches used to fill the blue coastline. Pandawa then grew into a commercial tourist site. Although seaweed farming here has not completely disappeared. The number farm is decreasing. Observe what's left from those quieter days, the fisherman tending their seaweed patch. Once in a while, locals still do fishing in the seawater. Enjoy the sight while it lasts. Because who knows, with all the resort constructions nearby, tourists might not see such activity like this again in a few coming years. Consider checking out other top destinations while being on this “foot” part of Bali Island. Nusa Dua is a 20 minutes drive from Pandawa. The all-inclusive beach is famous for its selections of 5-stars resorts. From banana boat to jet ski, the choice for watersports here is more varied than Pandawa. Uluwatu temple is 30 minutes driving westward. Get spoiled by the beautiful ocean view on the way up to temple. Keep belongings at hand because monkeys here are famously mischievous. There’s a traditional Kecak dance performance held every day around sunset. The beach opens every day from 7 AM to 7 PM. Pandawa has no shade or trees. So renting a beach umbrella is unavoidable. Nearby: Uluwatu Temple, Activities & Kecak Dance Show. Pandawa Beach entrance fee is IDR 15K per visitor. 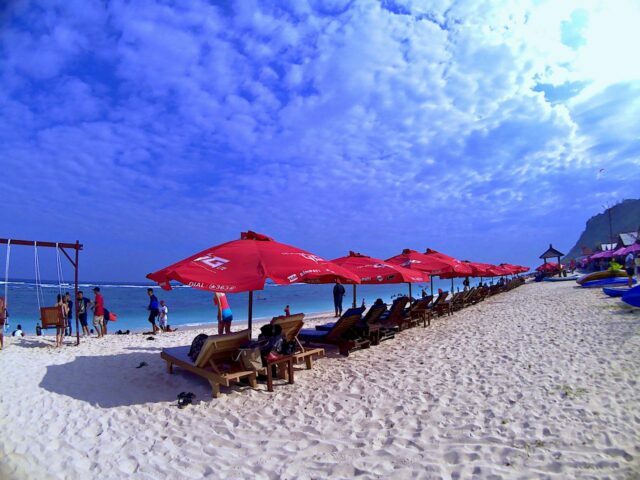 Umbrella beach and chair rental will cost IDR 50k. Parking costs IDR 3k for scooters and IDR 5k for cars. Nearby: GWK Cultural Park & Dance Performance Schedule. Pandawa Beach has a large parking lot. Other public facilities are still limited to toilets (IDR 2k) and washing room (IDR 5k). Small restaurants along the beach offer food and drinks at a reasonable price. There is a rental service for kayak and umbrellas. Little souvenir shops are also available. There is no public transport which stops in front of Pandawa Beach. Besides, it's still quite far (about 1,6 km) from the ticket gate to the beach. A private vehicle is the best way to get there. Rent a bike at IDR 65k/day or a car at IDR 600k/day. 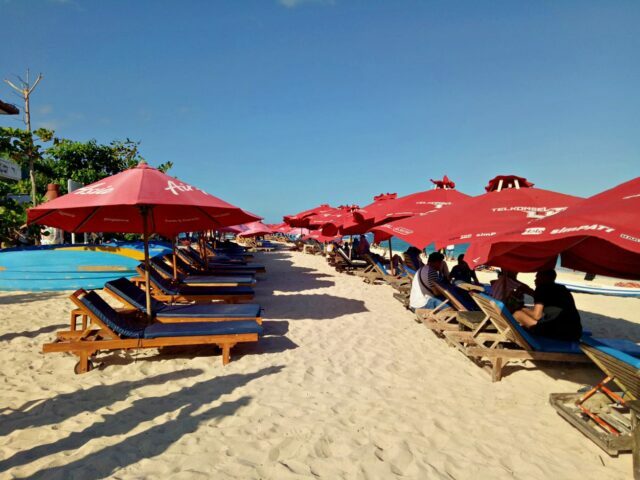 Only 40 minutes from Kuta area, Pandawa beach is accessible by following Ngurah Rai Bypass southward. At Jimbaran intersection, take a right lane toward Kampus UNUD road. Follow the road for 2,6 km until Udayana University intersection. Then take a turn left to Goa Gong street and follow this route: Goa Gong street – Sarmawangsa – Melasti – Pantai Pandawa road.